These Terms and Conditions govern your use of the Totally Derma® website (Site) and your relationship with us. When you register to use the Site you will be asked to create a password. You must keep this password confidential and must not disclose it or share it with anyone. You will be responsible for all activities and orders that occur or are submitted under your password. If you know or suspect that someone else knows your password, you should notify us by contacting Customer Services (see below for contact details) immediately. If Boley Nutraceuticals Ltd. has reason to believe that there is likely to be a breach of security or misuse of the Site, we may require you to change your password or force a password change on your account or we may suspend your account in accordance with paragraph 9 below. The content of the Site is protected by copyright, trademarks, database and other intellectual property rights. You may retrieve and display the content of the Site on a computer screen, store such content in electronic form on disk (but not any server or other storage device connected to a network) or print one copy of such content for your own personal, non-commercial use, provided you keep intact all and any copyright and proprietary notices. You may not otherwise reproduce, modify, copy or distribute or use for commercial purposes any of the materials or content on the Site without written permission from Boley Nutraceuticals Ltd.
Boley Nutraceuticals Ltd. reserves the right to refuse to post material on the Site or to remove material already posted on the Site. info@totallyderma.com and we will attempt to correct the fault as soon as we reasonably can. Your access to the Site may be occasionally restricted to allow for repairs, maintenance or the introduction of new facilities or services. Totallyderma.com will attempt to restore the service as soon as it reasonably can. Boley Nutraceuticals Ltd. may suspend or cancel your registration immediately at our reasonable discretion or if you breach any of your obligations under these Terms and Conditions. The Site is provided by Boley Nutraceuticals Ltd. (totallyderma.com) without any warranties or guarantees. You must bear the risks associated with the use of the Internet. 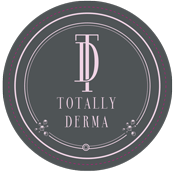 The Site provides content from other Internet sites or resources and while totallyderma.com tries to ensure that material included on the Site is correct, reputable and of high quality, it cannot accept responsibility if this is not the case. Boley Nutraceuticals Ltd. (totallyderma.com) will not be responsible for any errors or omissions or for the results obtained from the use of such information or for any technical problems you may experience with the Site. If Boley Nutraceuticals Ltd. (totallyderma.com) is informed of any inaccuracies in the material on the Site, we will attempt to correct the inaccuracies as soon as we reasonably can. Nothing in paragraph 9 applies to Boley Nutraceuticals Ltd. – Totally Derma®.com’s liability in respect of products sold through this Site. As a convenience to totallyderma.com customers, the Site may include links to other web sites or material, which are beyond its control. Totallyderma.com is not responsible for content on the Internet or World Wide Web pages. Totallyderma.com makes no promise that materials on the Site are appropriate or available for use in locations outside the United Kingdom, and accessing the Site from territories where its contents are illegal or unlawful is prohibited. If you choose to access this site from locations outside the United Kingdom, you do so on your own initiative and are responsible for compliance with local and National laws. If you breach these Terms and Conditions and Boley Nutraceuticals Ltd.- totallyderma.com ignores this, Boley Nutraceuticals Ltd. (Totallyderma.com) will still be entitled to use its rights and remedies at a later date or in any other situation where you breach the Terms and Conditions. Boley Nutraceuticals Ltd. (totallyderma.com) shall not be responsible for any breach of these Terms and Conditions caused by circumstances beyond its control. The Site is owned and operated by Boley Nutraceuticals Ltd. a company registered in England and Wales whose registered office is at 6 Tellisford, Esher, Surrey, KT10 8AE, England. If you have any queries, please contact info@totallyderma.com or telephone: 020 3126 6795 These are also the contact details for our Complaints Handling. Please read these product terms and conditions carefully as they affect your rights and liabilities under the law and set out the terms under which Boley Nutraceuticals Ltd. makes the products available to you (“Product Terms”). The purchase contract is made on ordering and paying for the goods and delivery. You will be charged for the goods and if applicable, delivery when you place your order. There will be no contract of any kind between you and us until you have purchased the goods. Up until payment, we may decline to supply the goods to you without giving any reason. At the moment the goods and delivery are paid for (and not before), a contract will be made between you and Boley Nutraceuticals Ltd.
Online Beauty and Skincare Companies have a duty to honour the product price point established by Boley Nutraceuticals Ltd. Failure to comply could result in account termination. You can pay by any major credit/debit card, Visa, MasterCard, UK Maestro. We also accept payment via BACS payment. Your credit/debit card details will be encrypted to minimise the possibility of unauthorised access or disclosure. Authority for payment must be given at the time of placing your order. For Distributors: Payment to be made in full at time of shipping. All orders will only be accepted together with payment made by credit card or BACS payment. Failure to meet this will result in further orders not being accepted. For those clients with an account, payment must be made within 14 days of statement. Failure to meet this will result in further orders not being accepted. In addition if applicable, late payment as stated in the Late Payment of Commercial Debts (Interest) Act 1998 will incur an interest charge of 8% above Bank of England base rate per month or part of. The buyer will also pay any collection costs, including reasonable legal fees to recover the outstanding balance (£10 fee for returned cheques). Overseas Clients must provide Boley Nutraceuticals Ltd. with a confirmed irrevocable letter of credit on an agreed London Bank, covering all costs incurred. Or by bankers draft. Or by acceptable credit card. Title of goods shall be retained by the Seller until payment in full of the price and until such payment the Buyer shall hold the goods and all items incorporating the goods in a fiduciary capacity for the Seller. In the event of any sales of the goods by the Purchaser prior to payment in full of the price, the Buyer shall hold the proceeds of the sale in the fiduciary capacity for the Seller and such proceeds of the sales shall be placed in an account of the Buyer in such a way as to be identifiable as the property of the Seller. In the event of non-payment by the Buyer by the due date, the seller shall be entitled to, in addition to all other rights to enter any premises where the goods may be and recover possession of them. Notwithstanding the foregoing provisions the goods shall in all respect be at the risk of the Buyer as regards loss or damage from any cause whatsoever as from the time of delivery of the goods to the buyer or to a carrier on behalf of the Buyer. The Buyer shall insure the goods accordingly. Delivery will be made to the name and address specified by you on the completed order form. We will not be liable non-receipt of goods incorrectly or incompletely addressed. Every effort is made to ensure goods are received by the Purchaser within 8 weeks of receipt of order (manufacturer lead times) though some items may be longer due to being made to order or out of stock. In these instances, anticipated delivery times will be given with no contractual obligation. No liability is accepted for loss or damage arising out of delays in delivery. Please note that some International orders may be subject to additional shipping fees. These fees are controlled by each country’s internal shipping agents and are outside the control of Boley Nutraceuticals Ltd.
All goods must be checked at time of delivery and any accompanying delivery note amended accordingly. Furthermore, we must be notified in writing within three days to ensure that claims may be accepted. Should goods not be received we must be notified within 7 days of the anticipated delivery date so that the appropriate action may be taken on your behalf. Failure to do so will result in replacement goods/credit/refunds not being issued. – Firstly, telephone Boley Nutraceuticals Ltd. advising the problem on 020 3126 6795 or email us at info@totallyderma.com – A valid reason why the goods are to be returned must be made. When accepted, obtain a returns number and include this on all returning documents/packages. – The letter/package to be clearly addressed to Boley Nutraceuticals Ltd. The returned goods must be received no later than 14 days from the date of delivery. – We may charge the Purchaser a restocking or recycling charge. This will be 15% of the invoice value. – All the items that the Purchaser is returning are to be in their original packing and be unopened and must be accompanied with a copy of the original invoice. which have partly been opened, partly used, or from which the seals or labels have been removed or tampered with. which have an expiry date of less than 12 months. Should the Purchaser fail to observe any of the above points this will result in credit/refund not being issued. All goods are returned at Purchaser’s responsibility, unless incorrect goods selection and shipping was made by Boley Nutraceuticals Ltd. We suggest that both certificates of postage and adequate insurance are sought. We accept no responsibility for goods lost during return transit. We endeavour to meet Purchaser individual requirements but we shall be under no obligation to accept cancellations or amendments to any order or any part of an order. Where such cancellations or amendments are accepted it is on the understanding that a cancellation or amendment charge may be levied. If we are hindered or prevented from performing any contract owing to any cause beyond our reasonable control or by our inability to produce products, we may at our sole option delay the performance of or cancel the whole or any part of the contract and we shall not be held responsible for such delay or cancellation or any inability to delivery. Risk shall pass to the Purchaser from the date of delivery of the goods. If you have an order query, please use our contact page or telephone us on: 020 3126 6795, or email: info@totallyderma.com you may also use these details for any Complaint Handling. If you have a complaint you can contact us in the first instance either by phone or email.